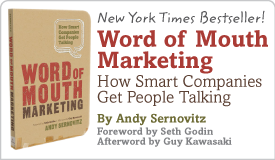 Newsletter #992: The "Better Than Marketing" Issue | Andy Sernovitz | Damn, I Wish I'd Thought of That! Anyone can buy an ad — but if you read this newsletter much, you know how we feel about most advertising. It’s expensive, it’s really hard to do well, and even if you can handle the first two, there’s a good chance it will get ignored anyway. Why not invest those ad dollars in something that does some good for someone else instead? The lesson: You have an opportunity to do something good for your community. 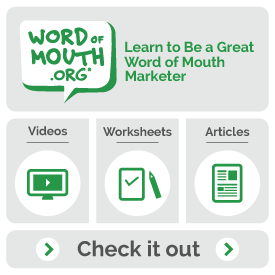 But it’s not just the right thing to do, it’s a better investment in word of mouth, in future customer relationships, and in your reputation. What if you could make a commercial that people actually wanted to watch? What if you made a commercial that people went to screenings to watch, that won awards, or helped support a movement? That might seem pretty extreme, but it’s what Patagonia did with their ad dollars. Instead of buying commercials, they sponsored and showed screenings in their stores of a documentary calling to remove “high cost, low value dams” called DamNation. (And it’s already inspired 25,000 people to sign a related petition.) It’s not a commercial at all — it’s a statement for what Patagonia believes about the environment and a way to use the company’s influence for good. The lesson: What do you think people will talk about more: a year’s worth of TV ads or a documentary that raised awareness for a cause? Coca-Cola has been doing a lot to surprise and delight lately. They’ve linked vending machines in India and Pakistan to help the two countries make friends, they’ve given away wrapping paper on poster boards during the holidays, and they’ve handed out flags to wave in airports. Their most recent campaign gave migrant workers in Dubai a chance to call home (a luxury that’s usually too expensive) by accepting bottle caps as currency in a phone booth. The video of this surprise and delight stunt is already one of their most popular on YouTube. The lesson: You don’t need Coca-Cola’s budget to do something to make someone smile. Coca-Cola saw a need, they found a way they could help (even if it was small), and they earned some big fans. To celebrate the Rubik’s Cube’s 40th anniversary, Google’s Chrome Cube Lab built a music machine that combines the Rubik’s Cube with a Roland TR-808 drum machine. Move around the cube, change the tempo, and even sample something from your microphone to make some music.